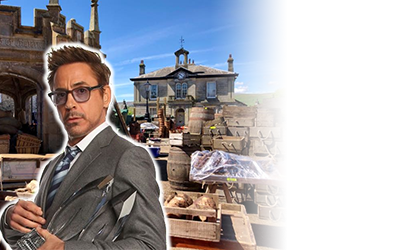 During the summer term myself and 14 other Lancaster University students were invited to work as location marshals on the second unit of the 2019 production of The Voyage of Doctor Dolittle, a Hollywood feature film starring Robert Downey Jr, alongside Tom Holland, Emma Thompson and John Cena, to name a few of the all-star cast. The company – Voyage Productions – is a branch of Universal studios, and we got to spend the week in Kirkby Lonsdale working alongside a whole cohort of film crew: directors, assistant directors, camera, sound and lighting teams, which have worked on a range of films, stretching from Mamma Mia 2 to Guardians of The Galaxy, as well as Skyfall, The Jungle Book and even Wonder Woman. Whilst on set, we were expected to hold back the general public during shooting times and offer alternative routes around the small town to ensure pedestrian safety as well as a smooth day of filming. We were expected to keep certain areas completely locked off from the public, and at other times we also escorted pedestrians across the set to help them to their destination. During the shoot days there were live horses and dogs on set, so it was imperative that we were alert and vigilant for everybody’s safety. As it was the second unit, there were a number of stunts and potentially dangerous scenes to be filmed which was exciting and interesting to watch behind the scenes. During our second day on set, some of us were asked to be fitted into costume as our assigned location meant that we could be caught within the shot. We were tailored some ‘flattering’ Victorian dresses and suits and stood out on set still maintaining the safety of pedestrians and residents whilst also fitting into the period dress and surroundings. The set was truly mesmerising, and it was fascinating to see how they had turned the small town of Kirkby Lonsdale into a Victorian village with so much interesting and fascinating equipment all hidden behind the scenes. The short-lived experience gave me a real taste of what it would be like to work on a Hollywood film set; the days were long and tiring, but there was never a dull moment. It was a perfect opportunity to network with industry professionals and to observe their work. There was an excellent atmosphere on set and a real sense of camaraderie between cast and crew. We were incredibly lucky to be given such an amazing opportunity to work on the set of a Hollywood feature film, and despite the long hours, I would certainly do it again in a heartbeat. It has made me all the more excited to work towards a career in the television and film production industry.